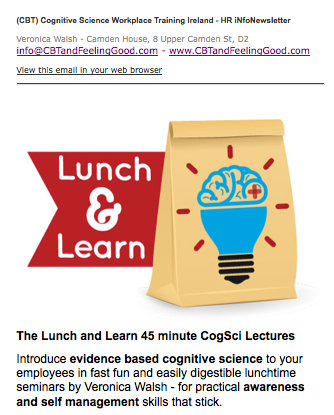 Scroll down for PDF extracts from the CBTandFeelingGood.com workshops / workbooks – for you to use as a self-help resource. Note to therapists: © Veronica Walsh, no re-print or distribution without permission – but ask me if you’d like to use them with your clients, I bet I’ll say yes! (scroll down to make a request through a reply/comment here on this post, or email me at veronica@CBTandFeelingGood.com). Knowing and understanding the theory of CBT is very important. But on it’s own its not enough to make really effective and lasting changes. For CBT to truly work you need to APPLY APPLY APPLY. And APPLY again. You don’t learn to ride a bike by reading a book about it. Important: turning your new learning into new thinking and behavior takes discipline – it requires you to build awareness of the way you think and feel and behave, and to develop the skills to examine and (literally) change the thinking when it’s distorted and irrational (thought stopping and replacing distorted self talk with realistic ‘it is more true to say..’ self talk). It requires that you examine and change your behaviours when they show a pattern of being self limiting, or self defeating, or self sabotaging. You will find you use the same style of distorted thinking across many situations, so if the journalling is done right once for this style, it’s done right forever – and the same findings can be applied as an ‘in the moment mental task’ over and over again to different situations, (without the need to journal every problem in your life forever – do it once properly for each situational anxiety, and it’s done). If you put the initial work in, it will pay dividends forever. We cannot truly examine our thinking and beliefs without writing them down, the distortions are in your face and obviously identified when you see them in black and white, but appear rational and plausible when left whizzing around in a mixed up jumble in your head. Work through the various tried and tested exercises like the ‘ABC’ and ‘silencing the inner critic‘ to find what works for you. Thereafter develop and hone the skills of ‘thought stopping’, changing your self talk and emotional reasoning by reminding yourself of your findings and conclusions and disputes. This will eventually be done by keywords that prompt association – mental tasks in a flash. All of this will help you develop new healthy alternative automatic thinking, and new healthy alternative behaviours. Helping you to become more calm and tranquil, with a more moderate temperament.If you make this approach your philosophy for living, evidence says that it is something you will begin to do automatically after the short to medium term – you can literally rewire your brain to make rational thinking and good coping skills your natural state. CBT is a science, believe it. And science is magic that works. Good luck and enjoy…. 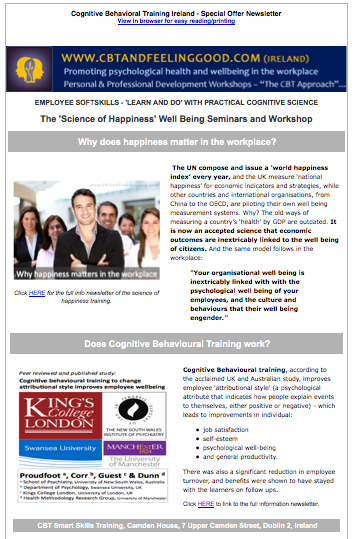 Managing ‘Emotional Reasoning’ with a Thought Stopping task: EmotionalReasoningPDF. Thankyou Veronica i live in the waterford area and its sooooooooooooo difficult to find someone who does CBT without hours of other therapy. Your site is a God send. Hi! I hope it is okay… I put a link to this blog post in my blog post today (misspelled, so corrected url via comment.) Thank you for making this information available. Just reading over a couple of the worksheets has given me more hope for recovery than my sessions with a psychologist. Thanks for the resources. I am in practice in Ottawa anada and have been looking for user friendly handouts that clients can use for discussion and homework. much appreciated. Thanks so much for use of the resources listed! I was looking for worksheets and other resources for a Trauma focused group that I am facilitating, and was given permission within a few minutes of e-mailing! These resources are vital for the group, and will be incredibly useful tools for other clients and clinicians. I will be telling all of my fellow clinicians about this resource! 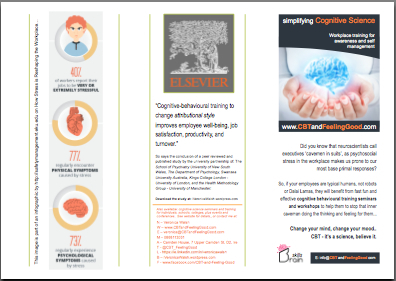 I like the way you have packaged the CBT information and they will augment the current handouts I use with my clients. The handouts are easily understood and will resonate with my clients. Thanks so much for the use of these handouts. They are very well done and easy to share with clients. I’ve had success already using them with my adolescent clients! What a wonderful resource for my practice. I especially like the “fight or flight” worksheet for my clients. Thank you! These handouts are wonderful, thank you so much for posting them online, and the fact that they are free to download and use! I am a therapist in a group home for teenage boys, and these are very helpful! Great resource for clients and workshops. Thank you! thank you so much! This Texan loves it that an Irishwoman shares her hard work. All your worksheets are set up so well and much better than mine! Hi Veronica Thank you so much Wow!! a lot of information your a gift for me today. Hi, you’re welcome. Re. faith/scripture references, no, I’m afraid not – I pretty much stick to evidence based best practice materials. Veronica – thank you so much for putting these together. You have no idea how many times I have done these explanations on the white board with patients and/or variations in notebooks. I appreciate your sharing. Thanks for sharing your knowledge and expertise in the form of such useful handouts and worksheets. I run an IOP for people on disability with emotional/behavioral health issues; much of our curriculum is based on CBT. So having some of your materials to share really adds to the program! Veronica, Once again, thank you for your generosity of spirit and your willingness to share your amazing resources. I have shared some of the CBT handouts with clients and am getting very positive responses! I’m very excited to find such a valuable and comprehensive resource for use with my program participants! Hi Veronica. I’d like to ask your permission for use with clients. I would like permission to utilize and obtain the information. Hi. I would like permission to use your information with my anxiety groups. I will not re-brand or redistribute/sale for profit. Such good stuff! Hi Veronica! I woul dlove to use your resources with my clients! Thank you so much, great information on here! Great resources and explanations. I would like permission to use your excellent resources with my clients. Hi Jenny. Great! Feel free to use whatever you like – once the materials retain my branding and are not redistributed/sold for profit to other practitioners. Regards, Veronica. I would love to be able to use these forms with middle school students since I work with many at risk kiddos! Please may I use info for my clients, doing my post grad cbt currently. Go for it Breda… Good luck. I am a Transformational Life Coach, I teach workshops and continuing education classes, some of these forms would add to my classes, may I use them with my students please. Thank you for sharing these forms! Hi Veronica. May I use these with my client? They look great! Hi Amanda, sure, go for it! Hope they work well for you. Hi. I would like permission to use your information with my anxiety groups. I will not re-brand or redistribute/sale for profit. I’m a Licensed Clinical Professional Counselor in private practice. I really like the handout/worksheets you post on Pinterest, especially CBT. Would you mind if I use some of them with my clients? I think they would be very beneficial. Thank you!!! Hi Penelope, sure, please feel free to use whatever you like, hope they work well for you. (Note: no rebranding or redistributing for profit). Regards, Veronica. Thanks for the resources, I have found them interesting and most helpful. I am new to this therapy but it is helping me deal with my anxieties relating to my sons hobbies. I am a student intern at an addiction recovery treatment center. I am starting to meet with clients individually and in groups by myself and am looking for good CBt handouts. Did you make all of them? They are wonderful! Do I have permission to use them with my clients? Thanks! (As long as the materials are not rebranded and/or distributed for profit). Hi Veronica – thank you for the time and effort you put into making such a nice resource! I appreciate that you have graciously made these available for other clinicians to use with your permission. I greatly look forward to using these in my practice! Thanks Veronica for producing such helpful and easy to understand handouts. They will be great to give out to my clients! I’m so grateful for your generosity in allowing others to use them. Hi Veronica, I love this site and I would like permission to use your material with my clients/group. Thank you! Veronica, I am a student attempting to run an experiment for a cognitive psych course, can I use your “common thinking errors” worksheet as one of my IV’s? Thank you , Chris N.
Thank you, Veronica! I work as an RDAP counselor in an Oklahoma prison, and your materials have been some of the most useful that I’ve found. I’ve begun using them to supplement the program that we are required to use, and I enjoy them very much. Thanks again! Reblogged this on drmunsif's Blog. Im a therapist and would like to request permission to use your resources. Thanks for a great site and really clear materials. Thank you for so generously sharing your excellent materials. I look forward to using them with my clients. The information is concise and the examples make it easy to grasp the concepts. Wonderful resources. Thank you for the worksheets I have just started using them with clients and they are very helpful. Hi Veronica, I would like to request your permission to use these resources created by yourself. They seem great and my clients would most definitely benefit from using them. I will not re-brand or redistribute/sale for profit. Thanks, Veronica. Your worksheets are great! Very descriptive and easy to understand. So helpful!!! Hi Veronica, I have just discovered your website, and am really excited by what I have read so far. I work as a school counsellor and some of the resources would be great to use with the students. Is it okay if I do so? Hi Veronica, Thanks for permission to use your handouts. I am a substance abuse counselor and they are helpful for coaching people in replacing the old ways with some helpful more healthy ways of coping and celebrating. Thanks for sharing your expertise and your work. Hey! I just found your page. I love the information and would like to print some to use with my clients. I will make sure the material is not re-branded and it will not be distributed for profit. Hi Veronica! I just googled and found this page. I work with domestic violence victims and would love to use your material in my work with them. May I use these at my university internship site? Perfect for my engineers. I tried to email for permission but the address bounced and said unknown. Thank you for these! Hi Veronica, I am in my residency for psychiatry and learning to do CBT with a patient suffering from PTSD. I’d love your permission to use these! Hi Denise. No, sorry, I do not print or mail. But my downloads are basic .pdf documents, so if you download Adobe Acrobat Reader you should be able to open them. OR – you can visit an internet cafe and open and print them. OR – you can buy any number of CBT self help books in local bookshops or on amazon.com. Hope that helps. Mind yourself, Veronica Walsh. Hello, Veronica. I work as a behavioral health social worker for an integrated health clinic. May I have permission to use your worksheets in my individual and group therapy sessions? Thank you! I am a mental health professional working in a school setting. I would love to have permission to use your worksheets with my clients. This is a great resource. I am a school social worker and work with many adolescents struggling with anxiety, depression, and STRESS. I’d like your permission to use some of your resources with my students. Thanks very much. I stumbled upon a link to your website while searching for more information on thought stopping techniques as I worked on a treatment plan. I’m feeling weary and drained from the workload and sometimes when it happens I look for information to educate myself and spark my thinking wheels. Your website did just that!! I was able to find the wording I needed to articulate interventions available to the client for inclusion in the treatment plan. After reviewing some of your worksheets, I’d like to use them with clients as written exercises in sessions. Their use would not include any modifications to the document. If permitted to use them, I’ll eventually have the time to circle back to your website and select worksheets to share in session. Please let me know when you are able to. Thank you. Hello Veronica. I am a student/ intern and would love to use this to help some people in group if I may. I look forward to learning the material and applying it to things in my own life as well. Thanks for the information and the material in a way that makes sense. Thank you. Thanks for that, and you’re welcome! Yes, please feel free to use any of my materials as long as they are not re-branded and/or redistributed for profit. What a wonderful website, Thank you for all these amazing resources. I would like to ask your permission to use these resources with my clients who struggle with anxiety and stress. Thank you. PS I do research in the field of connectedness to nature. I am working on a publication currently that looks at the effects of connectedness to nature and psychological well-being. Have you come in touch with any literature that combines CBT & nature? Delighted it’s useful! Thanks Carolyn. I am an outreach worker with Canadian Mental Health Association worker with adults 55+. After taking an introductory CBT course, some of our Clients approached me to facilitate more CBT sessions. After some research, I found your worksheets online, received permission to use them and started a group. There are 6 participants in the group and we have been meeting weekly for 3 months to work through the handouts together. We are a mixed group of retired citizens who have taken many introductory CBT seminars over the years. This course is different in that we apply, apply, apply the techniques. This constant practice is changing the way we think and feel (for the better). We like the versatility of the program and the ability to set our own pace, to backtrack if needed. Setting our own pace allows us the opportunity to support each others journaling and offer helpful suggestions. The group setting has created an atmosphere of trust where we feel we can share deeply personal problems and receive constructive nonjudgmental feedback from the other members. We look forward to our weekly meeting and are committed to continuing this healing and helpful experience. I’m so delighted to get this update! Thank you! Dear Veronica, I work as a guided CBT self-help worker, as well as an integrative therapist and I was delighted to come across your website. It’s well-researched, effective and generous with the right dose of humour thrown in! Our team is looking forward to using them with our patients. Thanks. May I use your worksheets and handouts for a presentation on anxiety and cbt to college students? Thank you! Your handouts are excellent and I’m sure they will be really helpful. Hi, I am a LCSW at a outpatient center in Ga and have my own PT practice and would like to use these resources with my clts. Hi Veronica. I work with young people in Carrickfergus and was hoping you might allow me to use your ‘silencing the inner critic’ download with a client? I’ve just discovered this site and it is a really great resource, thanks for your hard work. Thank you so much for your permission to utilize your worksheets. What a wonderful resource. Hi Veronica: I work with correctional clients in a small mid-west town in the US. and stumbled on your site by accident. Love it and would love to use your materials with my clients. Thank you for your wonderful CBT site and useable information. I’m wondering may I use your printouts with my counselling clients. Veronica, It is nice to find such a useful Blog post with so much CBT supportive documentation. I would like to recommend the page to my clients and use your materials with them, if that is ok.
Hi Veronica! I live in Buffalo NY and love your site. I would really like to be able to share your articles and handouts with my clients (I’m in private practice working in partnership with an ob/gyn practice – my clients are adult women, many of them with perinatal mood and anxiety disorders). Would you be so kind as to give me permission to do so? I am in private practice and would love to recommend your website and share your handouts with my clients. Would you please give me permission to do so? Thank you for providing such a wide and usefull collection of therapy materials. I am always looking for handouts and worksheets to supplement my therapy groups and you have provided an immense resource. The information that you have provided is very versatile and progressive. Both good qualities. The handouts are often hard to come by for material that is authentic and practical to use. I thank you for allowing me to implement some of the material in the work that I and others are engaged in. I wish you the very best in your continual efforts! Thank you so much for your generosity in sharing your website/handouts and information. I teach in a psychiatric nursing program and now with your permission will be suggesting this site to students. So very helpful and practical. I’m starting out as a new registered intern to get my hours for licensure. My theory base is CBT as well and I see that you have a lot of great tools here on your site. Would you mind if I borrowed some to add to my toolbox to help clients as well? It would help so much! Im a therapist and would like to request permission to use your resources. Thanks for a great site and really clear materials that would allow me to better serve my clients!!! Veronica – The worksheets on your website are wonderful! I am a licensed counselor in Florence, SC (USA). Would it be okay to use these worksheets with my patients? Veronica, thanks for what you are doing. May I use your CBT worksheets for Schizo-affective folks? Greetings from Autralia! I am a mental health counsellor and also delivers training to workplaces about mental health. I am currently looking at delivering some in-house training for our organisation ( non-government not for profit it) about managing stress by using some basic principles of CBT . Your worksheets are amazing and I would love to use of it for some practical exercises as we do our staff development day! Would this be OK to do please? I am a substance abuse therapist working in South Florida. I love to use CBT with my clients, and with myself. With the condition that I will not use them in anyway for profit or rebrand them may I have permission to use these worksheets? I also refer clients to your site as part of their aftercare. Hi Veronica, I am a Marriage and Family Therapists in Florida and provide supervision for therapists who are new to the field and working toward licensure. So often they are lacking in EB techniques that actually work for clients. I would love to be able to share your materials with them for use with their community mental health clients, as is with no re-branding or redistributing. Do you approve? Thanks! Fantastic website, Veronica! May I use your forms with some of my clients please? I am a therapist in a residential program in Michigan for adolescent males and would like permission to use your materials (no rebrand or redistribution) crediting you. We always give credit/sources in any material we use that is not our. Thank you. Hello, I would like your permission to use your resources with my clients. No redistribution! Just personal use with my clients. Hi Veronica – thank you so much. Your blog and handouts are absolutely spot on. I am a psychotherapist working on the South coast of England. Please may I use some of your material to offer my private practice clients? I would very much appreciate it if I were able to download and print some ofyour handouts. I would love to use your forms with members of my Academy of Wicca and Paganism, if I may. Veronica your handouts are great! May I use these with my clients? Dear Veronica thank you so much for graciously sharing your work. I work with adult survivors of childhood abuse and am looking forward to sharing some of the worksheets talking about the inner critic. Particularly like the body aspect being included in your work as so much of trauma work connects up with the somatic. I love your site, and your worksheets look fab and very user friendly. May I please use some of them? I would like to use your worksheets with my clients. I’m always looking for resources. Dear veronica, I love your blog and would like to use your worksheets with my clients. They are very clearly written and would be a wonderful resource. Thank you in advance. 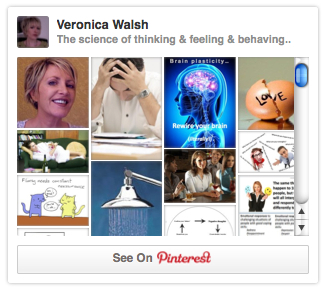 Hi Veronica, I am a therapist and, with your permission, I would love to use the resources you have on your blog. Thanks so much for the effort you’ve put into creating the worksheets! I’m a therapist and I’d love to use your resources, with your permission, with my clients. Thanks so much. Thank you – I’m delighted you find them of use. Yes please feel free to use any of my materials with clients, as long as they are not rebranded and redistributed. And feel free to sign up to follow the blog, I’ll be updating my handouts very soon. Hello. I just wanted to say Thank you for the free worksheets and self help guides.. I have been diagnosed with SUD, Bi Polar, and Generalized anxiety disorder.. I also have problems with depression. This website helps me tremendously. God bless you. Thank you so very much for making this content available online. A family member of mine doesn’t have the proper insurance to partake in any CBT or DBT programs. I truly feel that these work sheets/ articles, and a little effort on her end may finally give way to a more healthier relationship between us. Thank you so much for providing these to people like me who could really benefit from having one place to go to to find them! Hi Felicia. Thank you! And yes, I’d be delighted if you used any of my materials in your work – as long asthey are not rebranded / redistributed. thanks so much. Where can I find the pic of the gear brain? What is that called? Hi Veronica, I would like to use these with my clients no rebranding for redisttribution..
Hi Veronica. I would like permission to use your information for individual therapy! I do a lot of CBT and have not found a lot of great resources for clients Great information and resources! I would like to you use your wonderful worksheets in practice with some of my clients (outpatient individual therapy). Would this be alright? You have many great resources listed, would I be able to use them with my clients? Yes Lori M Pasion-Gonzales! (Great name). Hello Veronica. Thank you for making these available. I am a Canadian counselling student and would love to include your Blank ABCD form guide in a group process project I am doing. It is mock up of a group therapy series. Will only be used on my classmates. Obviously no commercial interest or income coming from its inclusion in my assignment. Could I use it? I’m so excited to have come across your CBT worksheets. I’m a CBT therapist who incorporates DBT skills into my practice. I’d like to request your permission to use your worksheets with my clients. I am an adult education teacher in Florida. I help inmates at the local county jail earn a General Education Diploma, and I incorporate life skills into the program. I would love to use the worksheets when and if it applies to what we are learning. I have in the process of starting a new Medically Assisted Treatment program. I am requesting permission to utilize some of your worksheets. I would also be willing to keep you updated on the success of our program. I am a license psychotherapist with substance abuse and forensics specialties in Wisconsin. Thank you again. I found your page very helpful please may i print and use the PDF’S for my petsonal use? I woud very much like to use your free resources with my clients, no reprint or redistribution purely for client use please? Thanks so much for providing such a great resource. Hi Veronica, I’m a new therapist with some CBT training, but looking for handouts to use with my clients. Your site is such a great resource, and I’m hoping that you will allow me to use your materials with them. Thank you! Hi Veronica. I am a therapist in Michigan, USA with my own practice. The information you provide could be useful to my clients’. With your permission, I’d like to use some of your material. Thank you. I’m a clinical psychologist working at a medical centre in sunny (at the moment) Sydney and I would love to use some of your very useful material with my clients contingent on your permission.